If you want your website users and visitors to be able to convert currencies then this is the widget for you. As the title says, this is the widget which users can use to choose between your selected currencies and have ads prices converted to their chosen currency. 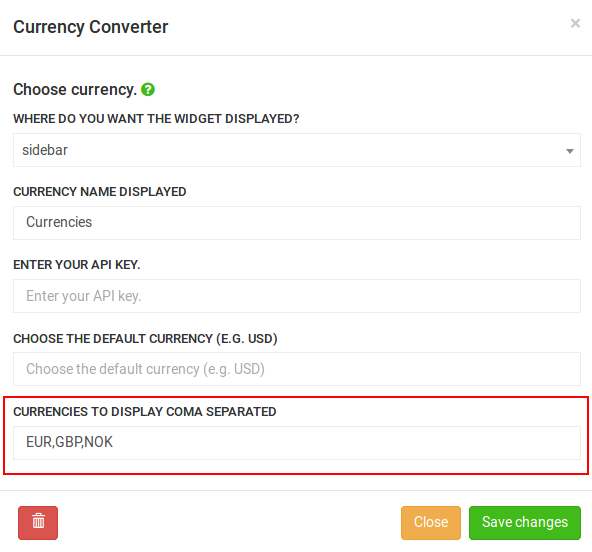 This is a mandatory step to follow in order to have the currency converter widget work. What you need to do is to go to https://fixer.io/product and choose a plan. Once you choose the plan you will be redirected to create an account and you will find the API key here. If your website uses SSL, please note that SSL encryption is only allowed for Fixer paid plans. Find the Currency Converter Widget and press Create. Choose where do you want the widget displayed and the name of the widget that will be displayed in your website. Type the Currencies to display, comma separated, or leave it empty to display all the currencies. Enter the currency of your site on Choose the default currency field. Use this field ONLY in case you are using a different currency than your local one and make sure that the prices of the ads have the same currency. Using this example you will have Euros, USA Dollars, Canadian Dollars and Australian Dollars available. Additionally we have created groups of currencies to make it easier for you. If you include the word major in the currencies to display, it will add USD, EUR, GBP, JPY, CAD, CHF, AUD and ZAR. Including the word european, will add ALL, BGN, BYR, CZK, DKK, EUR, GBP, HRK, HUF, ISK, NOK, RON, RUB, SEK and UAH. For Scandinavian currencies, include the word skandi. It will add DKK, SEK and NOK. Asian currencies can be added by typing asian into the currencies field. JPY, HKD, SGD, TWD, KRW, PHP, IDR, INR, CNY, MYR and THB are available for convertion. Include the word american to have USD, CAD, MXN, BRL, ARS, CRC, COP and CLP. Available currencies will be: ALL, BGN, BYR, CZK, DKK, EUR, GBP, HRK, HUF, ISK, NOK, RON, RUB, SEK, UAH, USD, CAD, MXN, BRL, ARS, CRC, COP and CLP. Available currencies will be: JPY, HKD, SGD, TWD, KRW, PHP, IDR, INR, CNY, MYR, THB, EUR and USD.